There could be many reasons to always upgrade Cisco ASA firewall IOS software to the latest version. The most common reasons are first to fix the bug, second to fix security vulnerability, and the last one is for the stability reason. In the clustering environment of Cisco ASA firewall, you will not experience any downtime during the upgrade process. In this instruction, TechSpaceKH will explains you how to upgrade active/standby clustering Cisco ASA firewall IOS software from version 9.8.2 to the latest version 9.9.2. 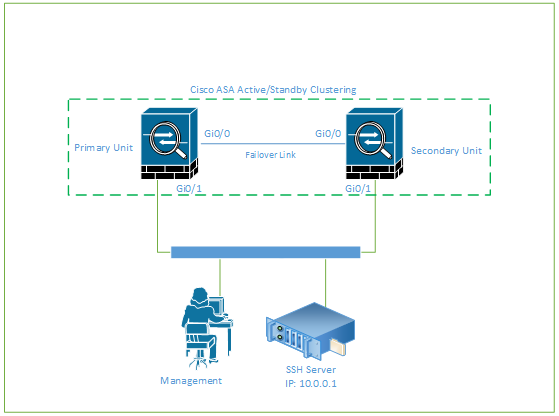 We had already set up the active/standby clustering on Cisco ASA firewalls. To simplify the explanation of the upgrade procedure, we will use the following network diagram for operate this IOS software upgrade. You need to upload Cisco IOS file “asa992-smp-k8.bin” which you have downloaded from with Cisco TAC account to SSH server. In our case, we will upload this file to directory “/home/vannath” on SSH server IP 10.0.0.1 from management workstation. After finish copying the IOS software files into each cluster unit, we need to verify these files with the following command to make sure that the file is not corrupted. Run the following command on both cluster units. Now, let remove any existing boot image configurations so that we can enter the new boot image as our first choice on on primary unit of Cisco ASA firewall appliance. Finally, we need to save the new settings to the startup configuration and go to the standby unit of Cisco ASA firewall to verify that boot image is set to “asa992-smp-k8.bin” using command “show run boot system” and after that reload the standby unit of Cisco ASA firewall cluster. Once standby unit is upgraded successfully then run “failover active” on standby unit to it become the active unit. Go to the primary unit of Cisco ASA firewall, save the configuration and confirms that boot image is set to “asa992-smp-k8.bin” using command “show run boot system” and after that reload the standby unit of Cisco ASA firewall. After the reload process finish, we need to verify if the Cisco ASA firewall device is upgraded to version 9.9.2 by running the following command on both primary and standby units. Now you should be able to upgrade active/standby clustering Cisco ASA firewall IOS software from version 9.8.2 to the latest version 9.9.2.. Hopefully, you can find this document informative. If you have any questions or suggestions you can always leave your comments below. I will try all of my best to review and reply them.